Andrade: I've Been Calling Out Erislandy Lara For a Long Time! 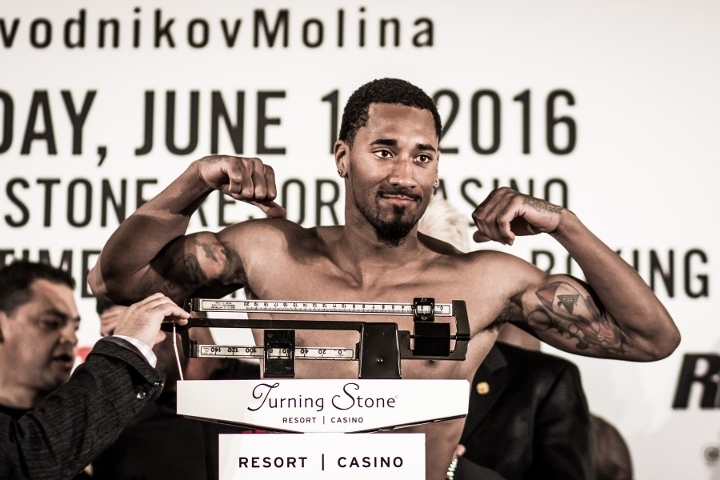 PROVIDENCE - A year after he was stripped of his world super welterweight title by the World Boxing Organization (WBO), undefeated super welterweight Demetrius "Boo Boo" Andrade has repositioned himself off of his sensational June 11 th stoppage of Willle "The Great" Nelson on SHOWTIME CHAMPIONSHIP BOXING®. The 28-year-old Andrade (23-0, 16 KOs) decked Nelson (25-3-1, 15 KOs) four times, finishing off his game opponent who'd never been knocked out, in the 12th round of their fight at Turning Stone Casino (Verona, N.Y). Andrade successfully defended his WBO International title and also gained several valuable options in terms of world title and/or major fights. He is now the No. 1 mandatory contender in the World Boxing Council (WBC), waiting to challenge the winner of a mandated title fight between new champion Jermell Charlo and WBC Silver title holder Charles Hatley. The 2008 U.S. Olympian is No. 2 in the WBO, No. 3 in the World Boxing Association (WBA), and Miguel Cotto is No. 1 in both of those sanctioning organizations. After his sensational, statement-making performance against Nelson, Andrade said he wanted to fight anybody whose name started with "C" and ended in 'O" - the Charlo brothers (IBF champion is Jermall Charlo), Cotto and "Canelo" (Saul Alvarez). "I am the best fighter in the 154-pound division," Andrade proclaimed. "I'm the No. 1 contender in the WBO. Liam Smith is holding my belt but I don't believe he'll fight me. I'm the WBC mandatory for the Charlo-Hatley winner. Once I get that belt I'll beat Charlo's twin for the IBF title and I've been calling out (WBA champ Erislandy) Lara for a long time. But 'Canelo' is the big money fight out there for me and who I want the most. I can be ready for him in September for his next fight. At the end of the day, we'll see what's up, but I want to get right back in the ring as soon as one of these guys step up to fight me." During his long layoff, Andrade made a conscious effort to be a more fan-friendly fighter, building up his strength to go along with his superior quickness. Many called his last fight, 'Mayweather-like,' in which Demetrius displayed tremendous power and explosiveness, which complemented his incredible boxing skills and defense. "When I first turned pro," Andrade explained, "I was getting in the ring with some good fighters, so I was cautious and settled in on just getting a victory. I learned that I needed to change in order to put butts in seats. I don't get hit and I also showed that I could go 12 rounds, good for experience, and still takeout a tough fighter like Nelson who had never been stopped. I wasn't going for the knockout but, after I caught him early with a right hook, I knew that it would come if I was patient and kept up the pressure. I think Willie can give any of the other top guys at 154 a good fight. He has a big heart and came to win. It wasn't as easy as it may have looked on the scorecards. Willie pushed me to look good. During my layoff, I worked hard on my craft to be better, concentrating on strength and conditioning, and it really showed in my last fight. I worked on my fundamentals and had a lot of success going to the body. I believe fans saw improvement in my performance and appreciated it." More comfortable knowing his promotional issues are now in the past (his A Team Promotions owns 50% of his rights to go along with 25% each for Banner Promotions (Artie Pelullo) and Star Boxing (Joe DeGuardia), Andrade is prepared to clean out the 154-division before eventually moving up in weight to take on Gennady Golovkin in what Andrade believes can be a mega-fight in due time. "I've always known since I first saw Demetrius in the ring at 14 years old that he was going to become a superstar," A Team Promotions president Ed Farris commented. "There were so many doubters and obstacles along the way. It sure took a long time to get here but I'm so happy for him that his moment has finally arrived. You don't know how good it feels to see him fulfill his destiny." Andrade, in fact, hasn't lost inside the ring in nearly eight years, when he was ripped off against Korean boxer Kim Jung-Joo, 11-9, in the quarterfinals of the 2008 Olympics in Beijing, China. The boxer named "Boo Boo" - as a kid with cuts, bumps and bruises - doesn't plan on changing his unbeaten script. "I'm still untouchable," Andrade concluded. "I've shown my continued commitment to boxing. It's 'Boo Boo' time!"